도기 녹유 탁잔(陶器 綠釉 托盞)은 황녹색 유약을 입혀서 만든 잔으로 잔을 받치기 위한 접시모양의 받침과 뚜껑을 모두 갖추고 있다. 곡선이 매우 완만한 접시모양 잔 받침의 안쪽 중앙에는 잔을 고정시키기 위한 원통형 잔받이가 높게 솟아 있으며, 잔 바닥에는 길다란 다리가 붙어 있어 접시의 잔받이에 들어가 얹히도록 하였다. 잔 뚜껑 꼭대기에는 보주(寶珠) 모양의 꼭지가 달려있다. 잔이 반구형 모양인데 비해 뚜껑은 경사면에서 지붕처럼 가라앉은 곡선을 이루고 있다. 이와같은 뚜껑의 곡선은 무녕왕릉에서 출토된 은제탁잔에서도 보이고 있는 것으로 보아 삼국시대 탁잔 뚜껑에서부터 나타나는 장식적 요소의 한 특징이라 하겠다. 황녹색의 유약이 비교적 두껍게 발라져 고른 유약 처리를 하였으나, 연질이어서 많은 부분이 벗겨져 암회색의 바탕흙이 노출되었다. 접시와 잔의 몸통 부분과 뚜껑에는 평행선 줄무늬가 새겨져 있다. 출토지와 제작장소는 알 수 없으나 삼국시대의 탁잔 양식, 특히 무령왕릉에서 출토된 은제탁잔과 매우 비슷한 모습을 보여주고 있을 뿐만 아니라 통일신라기의 청동기에도 보이고 있어, 통일신라 초기에 만들어진 것으로 추정된다. This earthenware cup was made by coating the cup with yellow-green glaze, and it has a saucer that looks like a plate and a lid. At the center of the smoothly curved saucer is a cylindrical support designed to fix a leg of the cup. This long leg of the cup at the bottom is designed to put the cup onto the saucer. The lid has a knob shaped like a bud. While the cup has the shape of a hemisphere, the curve of the lid slopes down like a slanting roof. Such curve of the lid, which is similar to the silver earthenware cup excavated from the Tomb of King Muryeong, is characteristic of the lids made during the Three Kingdoms’ Period. The cup is coated with thick yellowish green glaze; since soft glaze was used, however, some parts are peeled off, and the dark gray color of the earth is revealed on many parts. The saucer, body of the cup, and lid are engraved with a design of parallel lines. 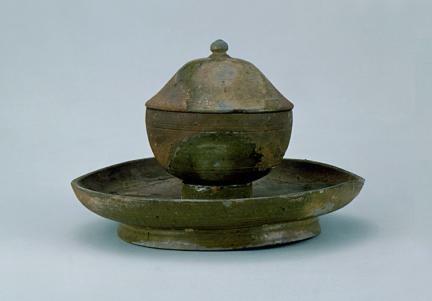 It is unknown where it was excavated from and where it was produced; since it has some similarities to the silver cup found from the Tomb of King Muryeong and the bronze ware made during the Unified Silla Dynasty, however, it is assumed to have been manufactured during the early Unified Silla Period.